Home >> Educational Toys & Learning Toys Resources >> Articles >> 2005 Holiday Hot Dozen Toys Announced! 2005 Holiday Hot Dozen Toys Announced! The annual list of the hottest toys for Christmas was announced on Thursday, October 6, 2005 by the Toy Industry Association and Toy Wishes Magazine. The list forecasts which toys will be the most popular this Holiday season, and most likely the toughest to find. The traditional fashion Barbie dolls and Bratz were replaced on this year’s toy must-have list by high tech electronic toys and entertainment devices. Black Belts Karate Home Studio: An at-home karate studio that helps younger kids learn the basics of karate, comes with a video. By SpinMaster. 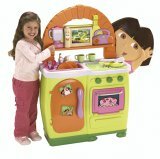 Dora's Talking Kitchen: A talking kitchen set incorporating the popular bilingual Nickelodeon character. By Mattel unit Fisher-Price. Furby: A new version of the 1990s favorite. Advanced technology and "emoto-tronics" make Furby seem more real with facial expressions, and communication in English and "Furbish". By Hasbro. I-Dog: A robotic dog with iPod styling that responds with lights, sounds and movement to whatever music you play. Can also be used as a speaker. By Hasbro. iZ: A posable three-legged music-making creature that can also be used as a speaker. By Zizzle. Leapster L-Max Learning Game System: A more advanced version of last year's handheld educational video game system. Can be plugged into the television for dual-screen capabilities. By LeapFrog Enterprises. Magnetix MagnaWorldCity: A magnetic building set using magnetic rods that snap together with steel balls. By Rose Art. 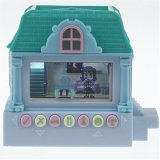 Pixel Chix: A handheld game featuring a virtual house with an animated girl. Characters play games and change fashions. By Mattel. Shell Shocker: A radio control vehicle that transforms from a "cyberball" to "cyberbeast." By Mattel unit Tyco. ©2004 Simply Toys, All rights reserved.